You say antojito. I say dinner! Alrighty then! Looks like I'm on a roll here with the Mexican food so I think I'll just keep on rollin'. It must be the cold that makes me return to the comfort food of my youth. Friday, San Diego had the pleasure of welcoming it's third storm front in three weeks. Just before the deluge began, my Auntie Syl and I were at lunch and I mentioned I was stumped on what to write for my next post. Because she had just had sopes the night before, that's what she suggested. Hhhmmm. Yes! I do love me some sopes! And with the rain coming, something to stick to the ribs sounded perfect. 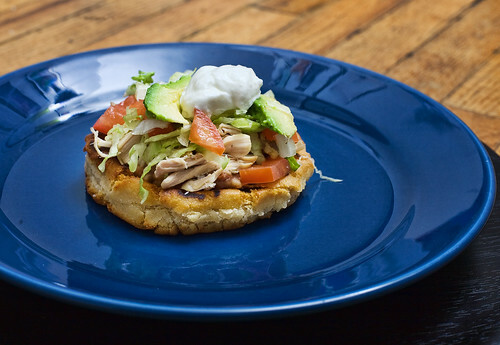 Sopes are traditionally served as an antojito – appetizer – much in the same manner as quesadillas, taquitos, and tostadas are. But in our family, they were always the main event. They consist of gorditas that are first quick baked on a hot cast iron griddle, then fried and layered first with beans, then meat and then toppings such as lettuce, tomatoes, cheese, salsas, avocado. Literally, gorditas translates to little "fatsos." I know, I know, totally unPC but trust me, it's always said with a smile and lotsa love. 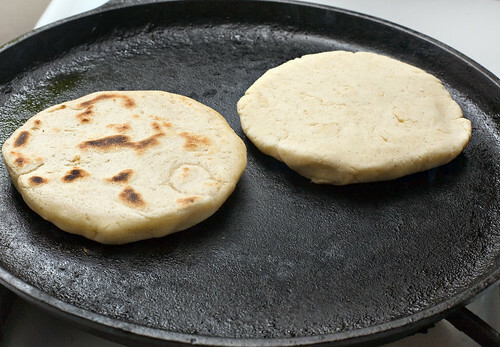 Anyway, gorditas are made with either masa de harina (ground maize treated with lime, ground and then dried to produce a fine corn flour) or white all-purpose flour. 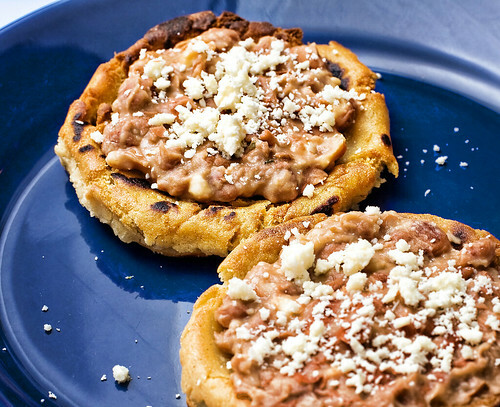 For sopes, we use the corn, not the flour. 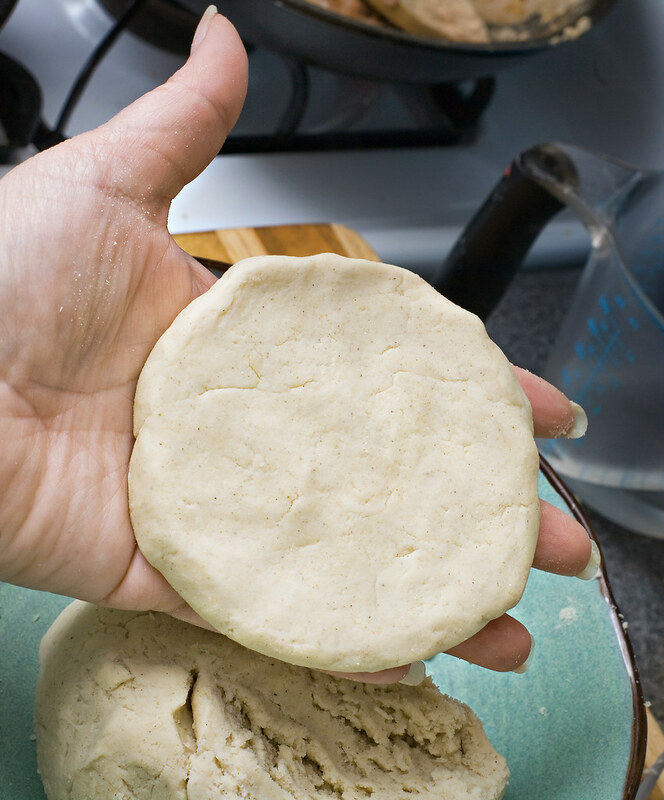 This is the same "masa" that is used for corn tortillas and to make tamales. Everyone in our family absolutely loves these. They are definitely comfort food: hearty, filling and tasty. First things first. Lets get the chicken started! 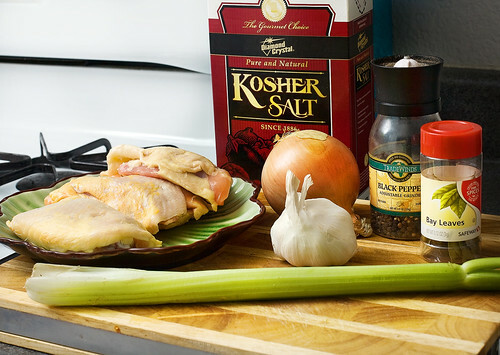 What you'll need: chicken (I'm using thighs because that's what I had in my fridge but you can use breasts if you if prefer), kosher salt, black pepper, bay leaf, garlic, half an onion, celery. 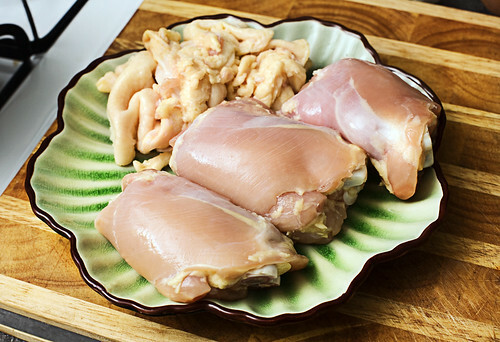 For economic reasons, I've been forgoing the extra cost of buying skinless boneless chicken if it's not on sale. So, if you're in the same boat, let's remove the skin and excess fat with kitchen shears. Set aside. When I first starting cooking all those years ago (gosh, I sound old), I used to struggle with getting these little suckers peeled. But not so much anymore. 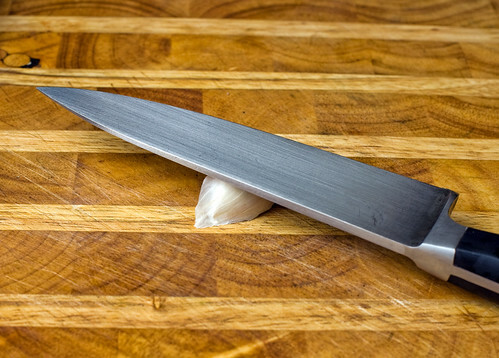 Place the back of your chef's knife, blade away from you, on the clove. 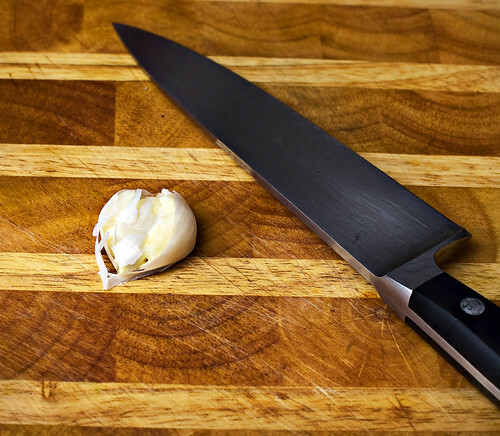 Using the palm of your hand, slam it down on the back of the knife. Ok, not so hard that you cut yourself. I don't want you emailing me telling me you cut yourself! Puh-leeze use common sense here. Look how easy it's gonna be to get that pesty little skin off now! 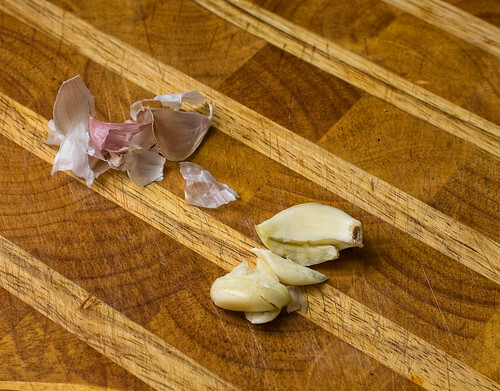 Oh, by the way, crushing the garlic clove does produce a stronger garlic flavor and since we're dropping two cloves into a pot of water, it's gonna be the perfect amount of garlic yumminess. 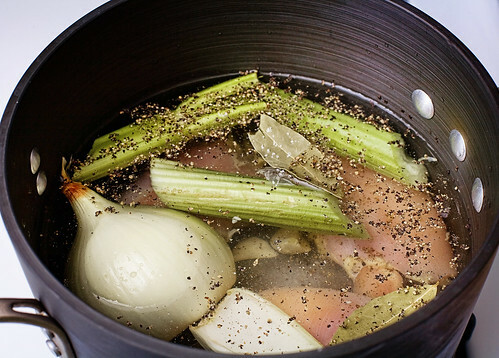 Place the chicken, onion and celery into a pot and fill with water to cover. Add salt, pepper, garlic, bay leaf. Bring to a gentle simmer and cover while we move on to the next steps. O.K., so while the chicken is cooking, we're gonna fry us some beans. 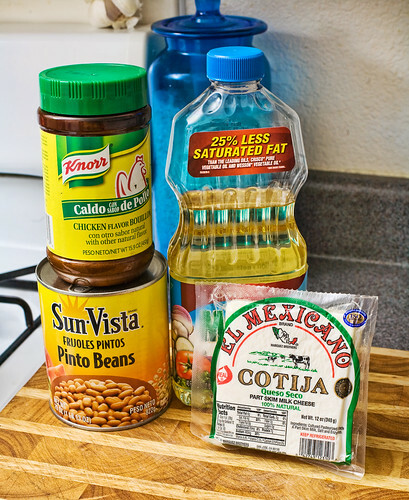 To save us some time, we're going to use canned pinto beans and for flavor, Knorr's chicken bouillon, queso seco (more on that later) and we'll fry in vegetable oil. Now to share a pet-peeve: When people interchange the term "refried beans" with "fried beans." So many people say "refried" beans when they are actually talking about fried beans. 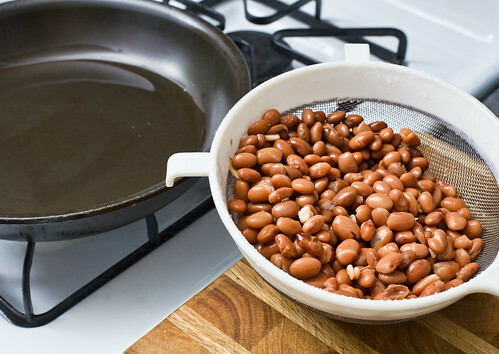 Refried beans are exactly that: beans that have already been fried once, then put back into a hot pan of oil and fried again. 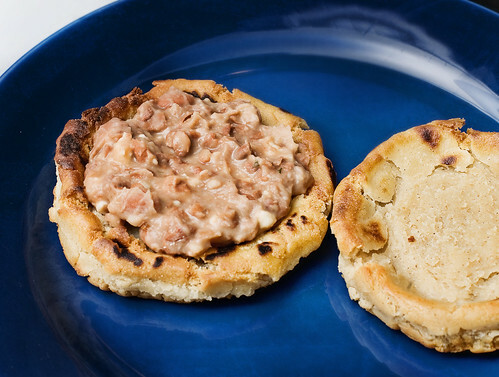 Trust me, if you tasted them side by side, the refried beans are truly yummy! But talk about calories! 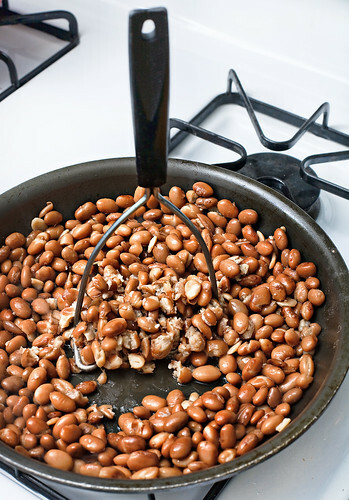 We're saving on some of those calories today by making fried beans. Strain and rinse the canned beans. Line the bottom of your frying pan with oil. Allow it to get nice and hot, almost smoking. Test the oil by placing a bean or two into the pan. If the oil is hot enough, it should sizzle immediately. Aw, the sound of sizzling pinto beans. Stir the beans and then using a potato masher, start mashing the beans. 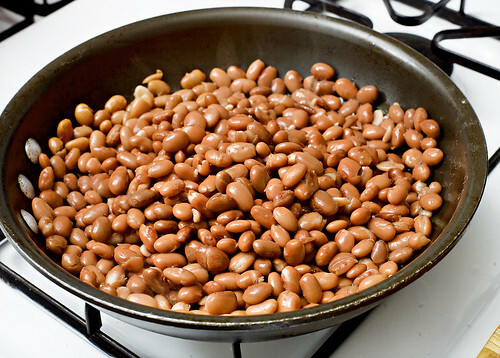 Some people have an aversion to fried and refried beans because they resemble the finely mushed texture of baby food. Personally, that's my aversion to canned refried beans. 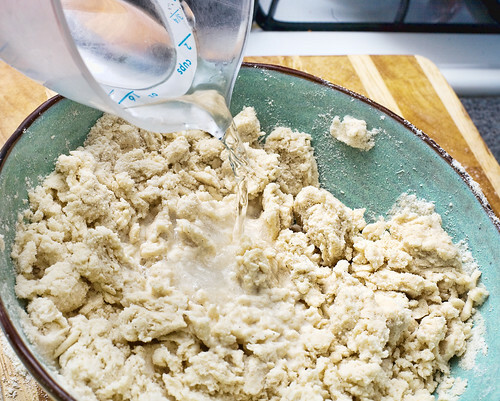 By mashing them yourself, you control the texture. Look closely and you'll see a few whole beans left. Perfect. Add water, bouillon. Stir well to incorporate. 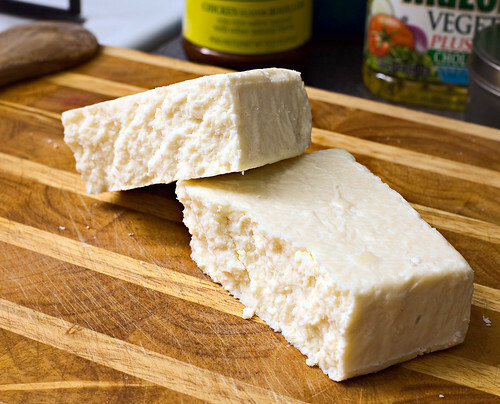 Cotija queso seco is a Mexican style aged hard cheese. Yummy grated onto beans, tacos, used in quesadillas. Similar to parmesan but less salty. 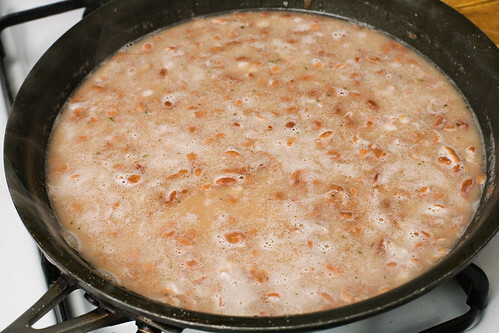 After about 10 minutes, the beans will start to thicken. Crumble about two teaspoons of the queso seco into the beans, stir and let the beans continue to thicken for about another 5 mins. Oh! Hey! How that get in here? 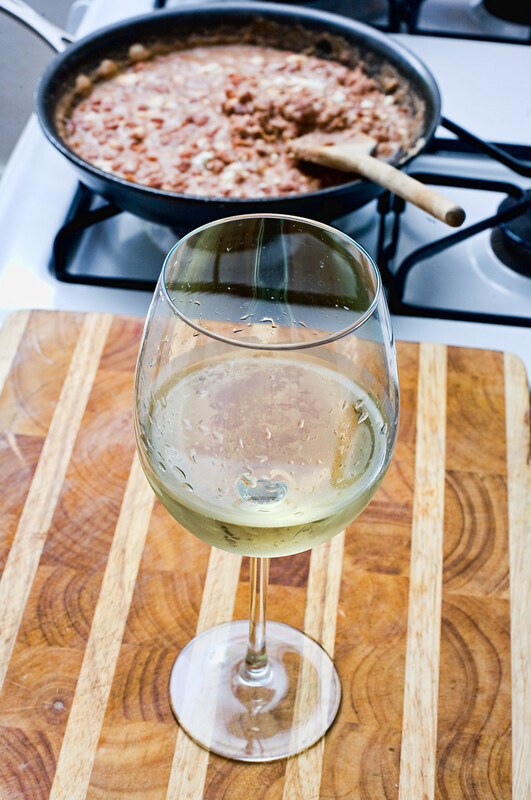 OK, my not so secret cooking companion: a yummy slightly chilled glass of Viognier. Soon to be enjoyed with my finished sopes too! Masa time! 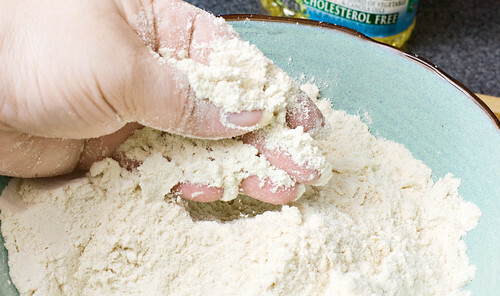 We have baking powder, masa de harina, butter, white all purpose flour, kosher salt, warm water, oil for frying. 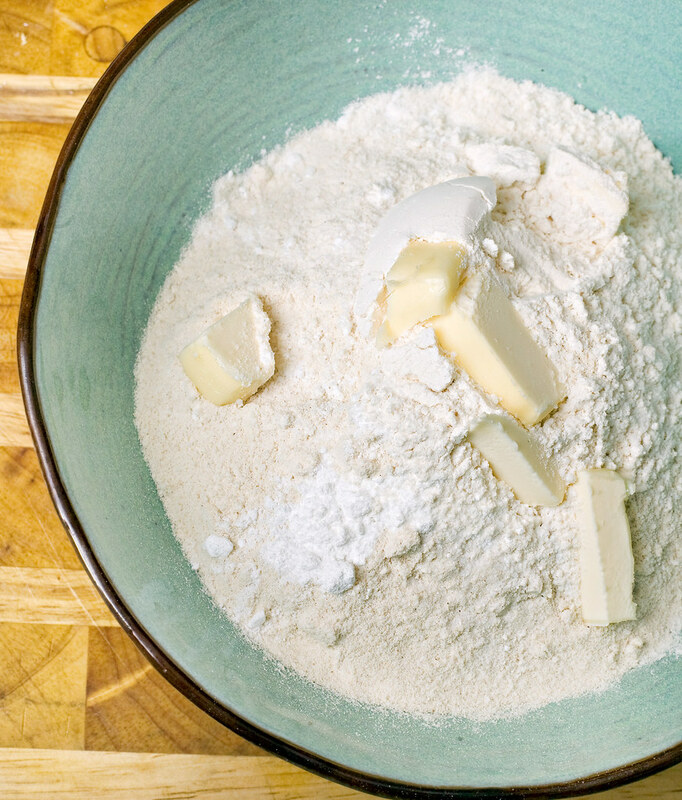 Dry ingredients go into a bowl. Add butter. Mustn't be afraid to get your hands in there! 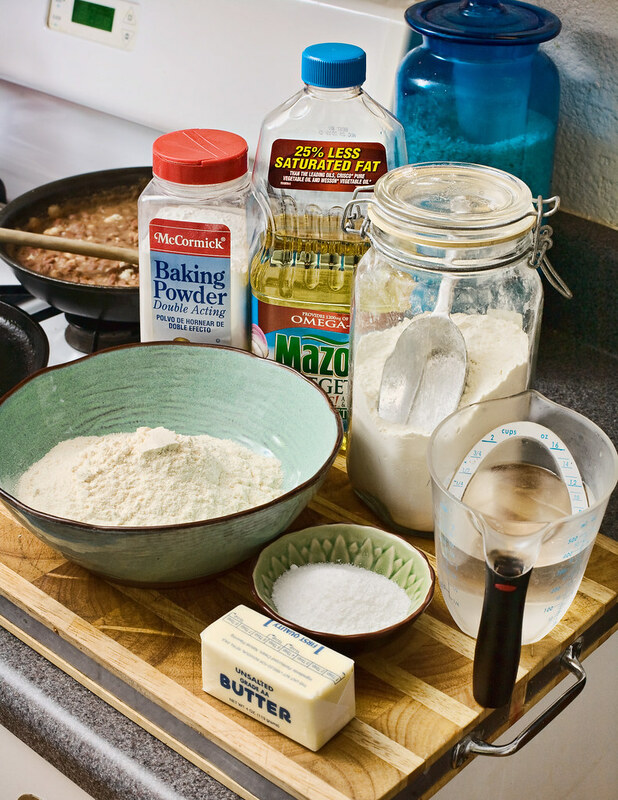 Get to breaking down and incorporating the shortening into the dry ingredients. 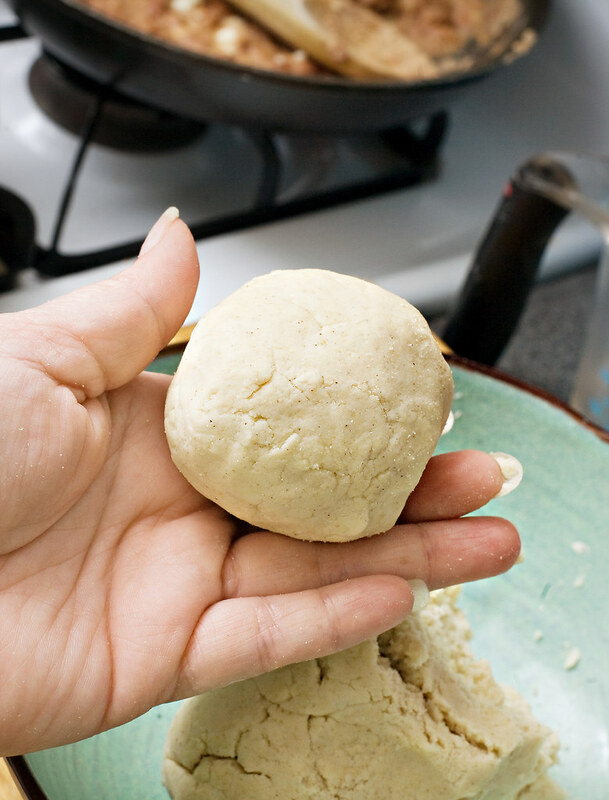 Add water a little at a time stopping to knead with your hands until the dough starts to hold together. Eventually it will start to pull away from the bowl. Shape into a ball until it holds. 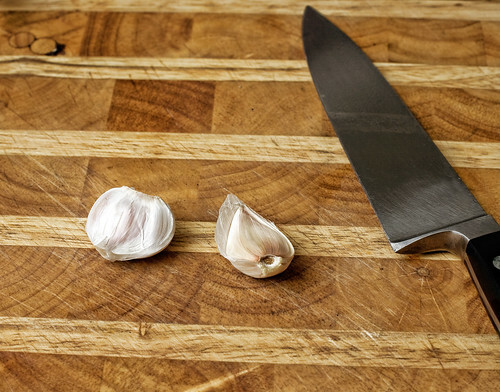 Pinch off a smaller ball of dough roughly the size of a head of garlic. 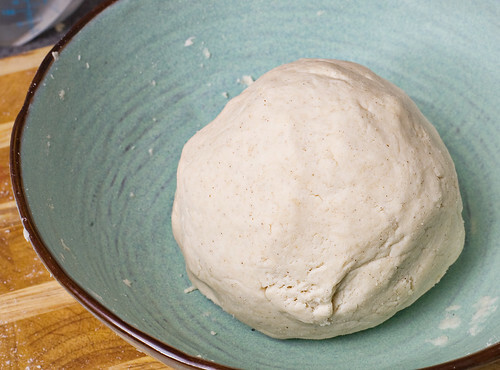 Form into a smooth ball of lovely dough. 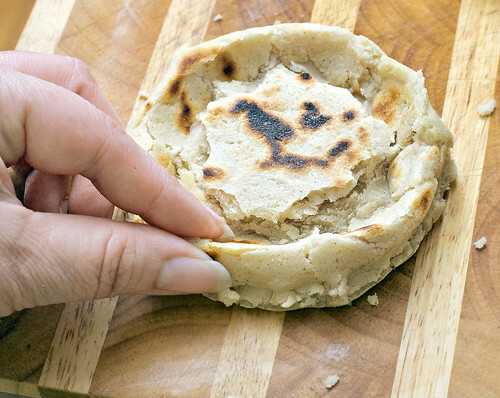 Flatten the dough into a disk about 5" in diameter and 1/4" thick by tossing the dough back and fourth, alternating hand over hand with slight pressure (think back to your childhood when you used to play Patty-cake). You could also, if you were so inclined, pull out a rolling pin. I prefer my hands. 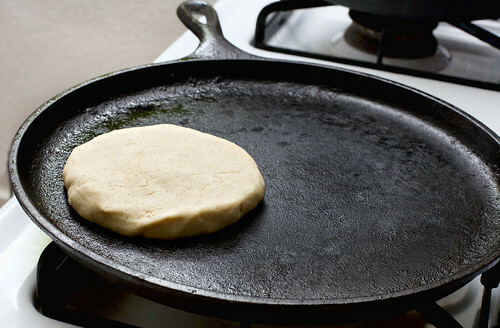 Place the gordita onto a hot cast iron griddle (medium high heat) or heavy bottomed fry pan if you aren't in possession of a griddle. After about three minutes or so, flip. It should look something like this. 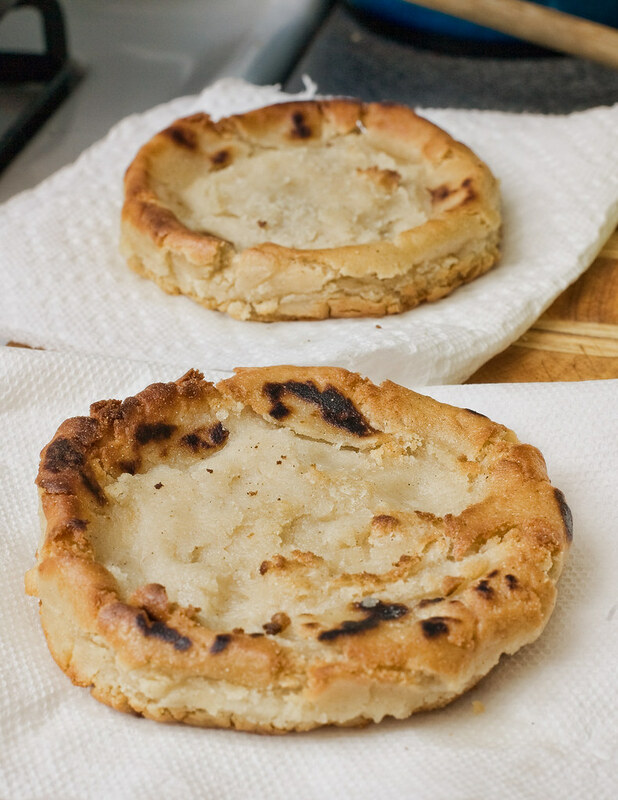 Once both sides are baked, pull off and allow to cool for a few minutes. Once it's gone from hot to warm, using your thumb and index fingers, pinch the edges to form a "crust" and a well for the toppings to go into. 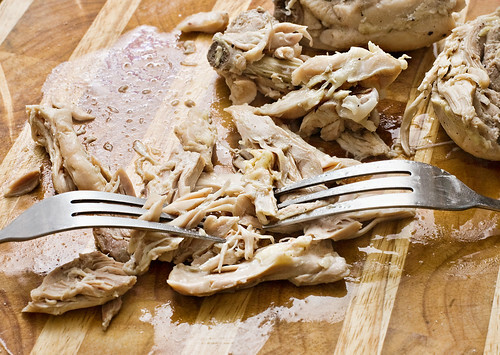 Now that your chicken is cooled down enough to handle, using two forks, pull it apart to shred it. Return to bowl and set aside. Time to get down to the real business: assembly! Now upfront and center: your cooked chicken, your baked and pinched gorditas, fried beans, lettuce, tomato, the other half of your onion, queso seco, sour cream. Add a little oil to a frying pan and put on medium high heat and allow to get hot. 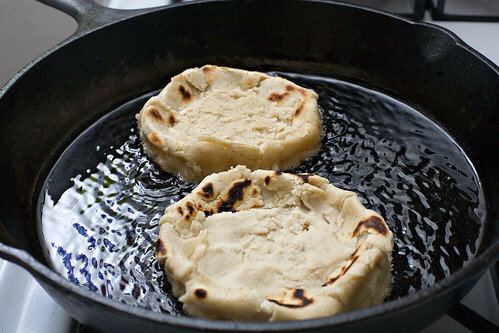 Place the gorditas flat side down first into the hot oil and fry to golden. Flip. Fry the other side to golden. Spread about a tablespoon of beans into the well. Crumble some queso over them. Place ingredients into a small stock pot or sauce pan. Add water to cover. Bring to a simmer. Cover. Cook for about 20-30 minutes or until the chicken falls off the bone. Remove from pot and place in a bowl to cool down. Once cool, use forks to pull off the bone and shred. Discard bones and return to bowl. Set aside. Place enough oil to cover the bottom of your frying pan and heat up on medium high heat. Drain and rinse beans. 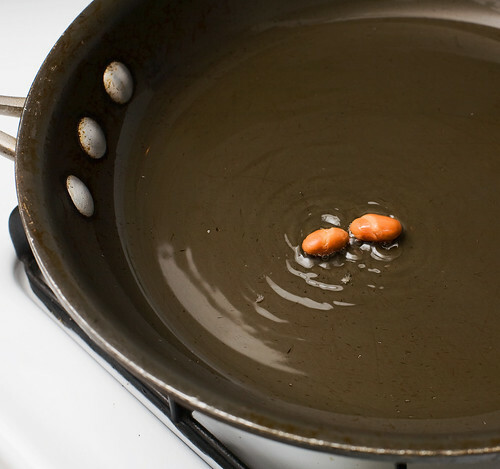 Test oil readiness by placing a bean or two into pan. If it sizzles, add beans. Stir and fry for 1 minute. Using a potato masher, mash beans to your desired texture. Add water. Add the bouillon. Stir well to incorporate. Simmer on low for 10 minutes. Add cheese. Stir. Simmer for 5 more minutes and turn off heat but leave on burner while you move onto the dough. Place a griddle or frying pan on the medium high heat to warm. 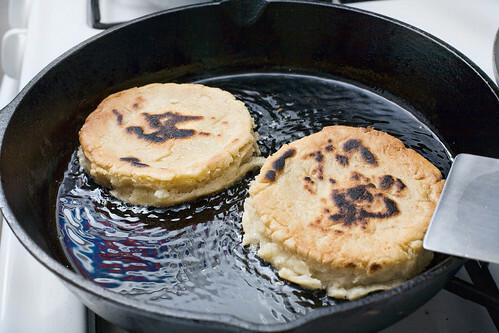 Place the patties onto the griddle and cook about 2 -3 minutes on each side. Remove from griddle and allow to cool for 5 minutes. While cooling, place a frying pan on medium high heat and add 2 tbs of vegetable oil (enough to cover bottom of pan). 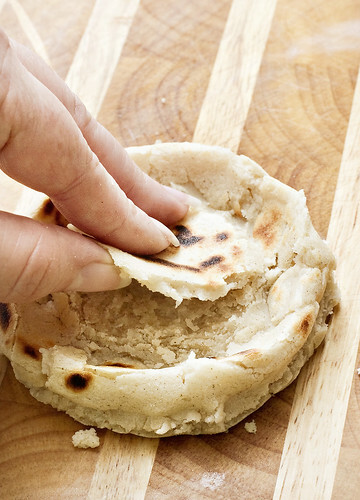 Now take the cooled gorditas, and using your index fingers and thumbs, pinch the edges to form a "crust" and an interior "well." Once you've gone the circumference of the gordita, remove the center crust. Place into the hot pan flat side down first. Fry to golden. Gently flip. Fry to golden. Remove and drain on paper towels. 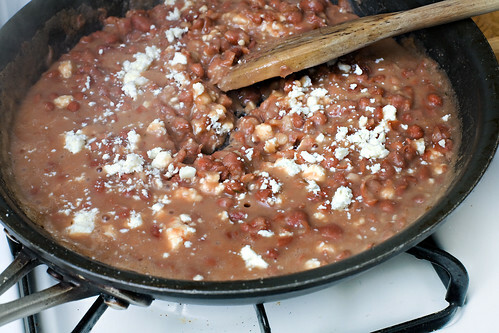 To assemble: Spread about 2 tbs of beans onto the center of the gorditas. Crumble or grate Cotija queso seco over the beans to taste. Add chicken. 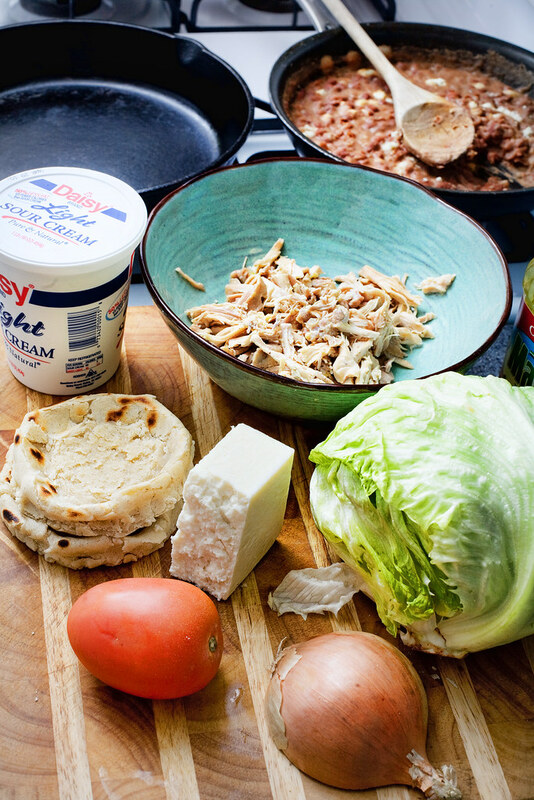 Add finely sliced iceberg lettuce, chopped onions, chopped tomatoes, sliced avocado, a dollop of sour cream. Optional: drizzle tomato sauce or salsa or taco sauce before adding sour cream. Your turn: What's your favorite comfort food? It was about 6pm by the time I had a chance to start dinner Friday night. 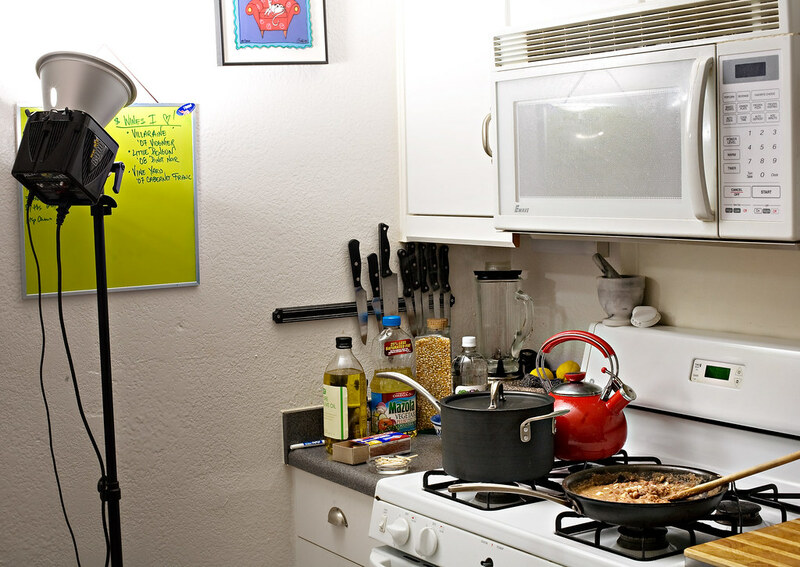 I've done a few posts with photos taken under mixed available light of incandescent and fluorescent sources in my kitchen. Not pretty. Lots of post processing. Friday, I decided to set up a single flash to just help me out a little. So this is the set up in my teeny tiny kitchen. One single 400 watt head bounced off the white wall and ceiling basically creating a large faux softbox in the process. It allowed me to shoot at 100 ISO, f/10-f/13 depending on my position so I had pretty good DOP (depth of field), good saturation and the bounced light cut down on the harsh shadows. 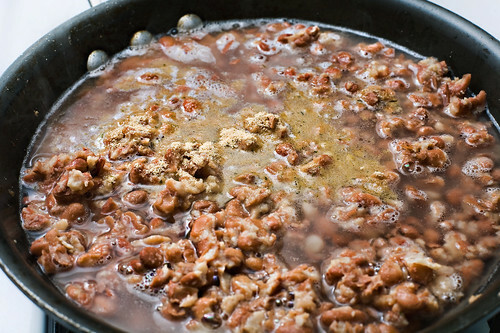 if you were going to make re-fried beans would you do the re-frying before adding the water and bouillon? also do you have to let the beans cool before re-frying them? would I take the beans out of the pan, re-oil the pan and then re-add the beans? 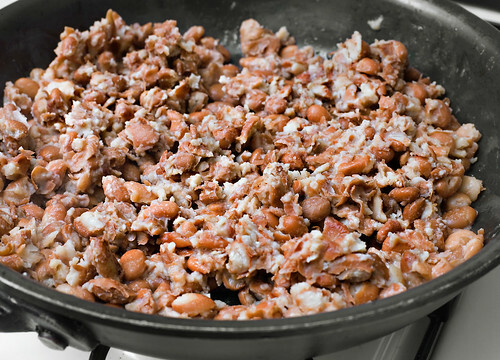 how do you make re-fried beans? Fry them in the manner described here minus the addition of the cheese. Remove from the pan. Wipe pan clean, add oil to line bottom of pan (you could be authentic and substitute lard for both the initial frying and the refrying. Seriously, it's the best! ), let the oil start to smoke then carefully return the fried beans to the pain. Be prepared for flames - especially if using lard. If it flames on you, you're truly an adopted Mexicano! LOL. Anyway, stir the beans. If they are a little too dry, add either a little more water or prepared chicken stock. Add cheese if you like. Panela goes even better in refried beans over the queso seco, btw. My favorite comfort food is... food? Okay, I am partial to carbs--pasta, french fries. 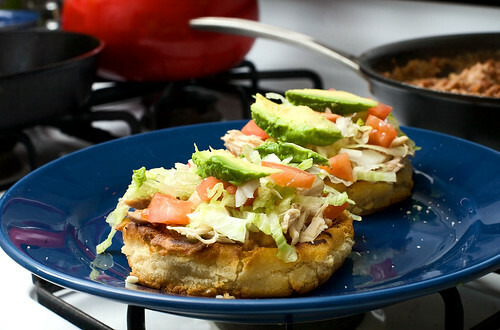 :) And chips n' guacamole, but I've never had sopes. 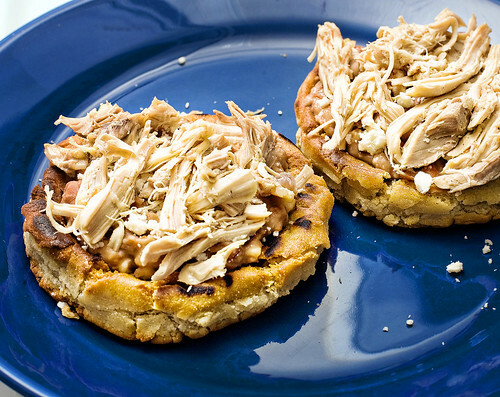 @alecia sopes are wonderfully soul satisfying. 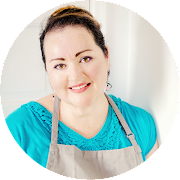 and you can easily make them vegan subbing vegetable oil for the butter in the masa and using vegetable stock for the beans in place of the chicken bouillon and water. we used to have them without meat often and i imagine you could top it with some crumbled tempeh on it for added umph!